Here is something that I think people need to be aware of. Yesterday, November 18, 2011 was the day the announcement was made of the WindMade Initiative. This consortium of major corporations is dedicated to preserving the environment my using "green technology" in the manufacture of products. AAMOF the pledge is to procure at least twenty-five percent of their power from wind energy. Personally I think this is a movement that is long overdue. While we all have been aware for several decades that our energy consumption is increasing while the supply remains static, there has been some, but not enough, movement toward renewable energy development & usage. It has appeared that smaller companies and individuals have put some effort into this, but the real way for this type of technology to make it to the forefront is for large companies with corresponding higher profiles and carbon footprints to endorse the move to these types of renewable energy sources. That's why I was excited to read about the creation of the WindMade consortium. These companies have the financial resources and the corresponding marketing budgets to make something like this work. I'm also excited about the published goal of 25% of their power from wind energy. That number is significant. It's not some tiny percentage or some nebulous goal that states no direct measurable number. Many times I've seen things like, but they are lip service only. This appears to me to be the "real deal". I'm also impressed with the number of front line type of companies that have decided to become involved with WindMade. This is not an inclusive list, but members include: Motorola Mobility, Lego, Bloomberg, and the World Wildlife Fund. These are organizations that are well known and have the wherewithal to make a move like this happen. Also, devices and products manufactured under these standards will bear the WindMade logo. Look for it to be sure you're helping support the initiative. The more we as consumers spend our money on these products, the more we support the initiative and the things it stands for. For all the info and for all the companies involved, visit the WindMade site. As a member of the Eco-Dentstry Association's Advisory Board, I'm concerned about the well being of our planet and what we're going to leave for our kids. Over the past few years I've begun to become more and more concerned about that issue and I'm trying to do all I can to help make our world a better place when possible. To that end, today's post is a geeky one (big surprise there, I'm sure), but this is a topic that can affect not only a dental office, but your home as well. So even if you are reading this blog, not as anyone involved in any aspect of health care, but you're just here because you re a geek, read on because I think there is something in this post for everyone. Now we all know a few years ago we began to see a push to move away from the traditional incandescent bulb. The reason was a simple one. ICB's are pretty inefficient when it comes to utilizing electricity. The ICB that we are all familiar with use electricity that is passed through a metal filament. As the current passes through this filament (thin wire), it heats up until it glows. This glow is what we call "light". The bad news is that this "light" is a byproduct of the resistance of the current passing through the filament. As I said before, the current passes thought the filament until it generates enough heat to make the filament glow. What this means is that while the ICB does generate light, that light is a small byproduct of the heat. Most ICBs are terribly inefficient using only 10% of the energy to generate light. The remaining 90% is given off as heat to the surrounding environment. This heat causes air conditioners to work harder which, in turn, creates more demand on the power grid. Because of this inefficiency of the ICB, there was a push to move to a type of bulb that utilized fluorescent technology (pictured above). These bulbs are called "Compact Fluorescent Lamps" or CFLs for short. These bulbs are very bright, very energy efficient, and operate at a much cooler temperature. They tend to use 3-4 times less power than ICBs and last 8-15 times longer. When one considers those numbers, it's easy to see why there was a push to move away from ICBs and toward CFLs. However, CFLs were not without their drawbacks. They tend not to have as "pure" a light at ICBs with many people stating they look "yellow" to them. They also do not come on at full strength when in a cold environment. The tubes are filled with a gas that must warm before full illumination can occur. This means that when first turning them on in a room that is cold (or outside in winter) it may take several minutes for the bulb to reach full brightness. However, those drawbacks were minor compared to the fact that fluorescent lights, including CFLs, contain mercury. This means that while they help save the environment with energy usage, they are much more expensive to dispose of properly. Mainly because of this, there has now been a movement to discontinue or decrease the use of CFLs. So.. what do we do? Read on! To the rescue comes the LED. For those of you who have been to one of my lectures, you've probably heard about my love affair with the LED. They are amazingly energy efficient, instant on, last for years, and are easy to dispose of. The photo above is a bulb from Panasonic that just won a Good Design Award. The "bulb" is actually an LED but it looks and acts very much like a traditional ICB. This particular model is said to last 40 years before needing replacement and it will operate at a minimal cost. It is not on the market... yet. However with the looks and efficiency it's only a matter of time before Panasonic or another electronics manufacturer steps up and begins to mass produce something like this. When they do, I'll be at the front of the line. This type of product will make the world a better place for our children and after all isnt' that what it's really all about??? Last April I was forced with a dilemma. I was a user of a web based service called Jott, but they had been acquired by another company who had swallowed their technology to incorporate it into another project. Jott, as I know it and loved it, ceased to exist. Without going into great detail, Jott was a web based service that let you create multiple todo lists. You could enter them either by text or by typing and then set alarms. When the time came, Jott would send you an email and a text message reminder. It was great for those times in the car when you suddenly had a great thought or remembered something but you couldn't write it down. You'd just call Jott, dictate it and easily within 30 minutes, it was transcribed and available to you in whatever list you specified. When Jott had the plug pulled, I was despondent. I had been using it and even recommended it to patients. There were people all over the country that had heard me talk about it in lectures that were using it. I was bummed! I made a blog post about the demise of my beloved Jott and , like most instances in my life, technology came through! My blog post brought comments from 2 readers. The first was from Trader Jones and the second was from my buddy Marty Jablow. Both of them were former Jott users who had moved to Reqall. Reqall was a Jott competitor who had survived the shakedown of the buyout that Jott had gone through. So... I deleted by Jott account & then moved some of my lists over to Reqall. I started with things that weren't "mission critical" if I lost them. You know, things like music that I was thinking of downloading, and items I was considering picking up at Home Depot, Micro Center, and Radio Shack. Once those items were transferred and not lost, I began to really use Reqall. It became my "go to" place for organizing my life. Reqall now holds all of my "todo's", "follow ups", etc. After using a free account for only about 2 weeks I jumped in with both feet and became a Pro Account Holder. I'm here to tell you that if you are looking for a way to better organize your life, you definitely need to take a look at Reqall. The site and it's apps for both iOS and Android, keep me better organized and I don't forget things nearly as often. My life can be really crazy (more often than not these days) and it truly pays to have an electronic system looking over my shoulder to help me think about things I should be thinking about. Reqall is just the thing for people like me. For all the details, check out the company website. File this one under blog posts "about life". If you're a geek like me, have a longstanding relationship with Legos. When I was a kid, they were just bricks that you snapped together and built structures you could visualize with your " mind's eye". Nowadays they come in kits that build actual models and working toys. When I was a kid, we relied on the Revel company to supply us with models, but those models required model glue (remember that aroma?) And when you were done, the models were not really "workable" but instead were usually fragile and for display purposes only. Oh, and as a geek who also had to take a decent amount of chemistry I can tell you a fair amount about the aromatic hydrocarbon called xylene (if memory serves me correctly) that gave the model cement its unique smell, but that is a completely different blog post altogether. So... in the 80's I remember seeing Lego kits that were like models. They weren't just collections of bricks, but were, when assembled, an island, a pirate ship, an airplane, you name it. I can remember sitting on the floor with my young nephew helping him put together a pirate ship and pirate island. The idea was brilliant. Models that not only looked cool when they were assembled, but that worked and moved. You could actually play with them!!! I've got to give a lot of credit to the minds at Lego. They have created amusement parks, podcasts, new lines of products, video games and they have supported movies and popular culture. Being a family man Lego has been a part of my life for a long, long, time. Online game will close on January 31, 2012. The LEGO Group’s digital offerings will continue to develop over the coming years. November 4, 2011 – The LEGO Group today announced that it will close LEGO® Universe, an MMOG (massively-multiplayer online game) that has been in operation since the autumn of 2010. In spite of very positive player feedback and a large number of players in the free play zone, it has not been possible to convert a satisfactory number of players to paying subscribers. It has therefore been decided to close the game as of January 31, 2012. As a consequence of the closure, the LEGO Universe staff has today been informed that the ‘Play Well Studios’ in Louisville, Colorado and the game’s marketing function in Billund, Denmark will be closed. This will affect 115 employees. All affected employees will be offered assistance in finding new jobs inside or outside the LEGO Group. Amazon & Apple are now Both in the Cloud... Let the Games Begin! I've been blogging about the Amazon Cloud Drive here for a few moths now... basically because it has been available and I've been using it. The "it's been available" part in that last sentence is huge, because Apple just brought their iTunes Match service online basically yesterday. It was supposed to launch by the end of October, but delays pushed it back until Mid-November. Now we get to see the competition heat up between a couple of Cloud giants. Amazon has made a huge name for itself with the Kindle and all kinds of Cloud storage while Apple has iTunes which is really what (along with the iPod) started the digital music revolution. Both companies are coming at this from different angles. Amazon is offering 20GB of Cloud Storage for $20/year. Apple is providing their iCloud service for $25/year and it allows users to have up to 25,000 songs in the cloud. Let's take a look at the differences because, other than the Cloud, there are not a lot of similarities. Amazon: $20/year for 20GB of storage, which you can increase. Amazon Prime members get unlimited storage as part of their membership fee. Users must upload their songs (which can be time consuming and bandwidth consuming depending on the number of songs in your catalogue. The service will take any MP3 songs (that is the format that Amazon sells) but will not take any type of encrypted music. The songs can be played on any device with an Internet connection vis streaming from the cloud, but you can also download the songs to any device capable of playing MP3's. Apple: The iCloud service is $25/year for up to 25,000 songs. I'm not sure how my GB that would translate into, but i've got to think it is comparable to Amazon. No uploading of your songs is required. Utilizing iTunes Match, the service scans your music collection for songs & if the same song is available iTunes, you have access to it. IF Apple doesnt' find it, it will upload YOUR version. This could prove to be a big time and bandwidth saver. Also, the songs that iTunes will play that match your songs are 256Kbps which are very high quality. The one real downside to this service is that it limits you to 10 devices. Now in the big picture, that probably really isn't a huge deal. I mean, how many of us have 10 digital music players? However, we dont' know what the future holds and I've never been a big fan of anything that provides "limits" to my usage, etc. So... I don't have a clearcut winner in this race. I'm already an Amazon user and I've already uploaded my entire music collection to the Amazon Cloud Servers. It took several days (I have around 60-GB of music). I have had a great experience with the Amazon service and I continue to upload any new songs I buy to my Cloud Storage. I probably will not be using the Apple services but that is only because they weren't first to market. I've heard about this for a while now from Google who has been working on this for a while and are now advertising it on the Mastercard website, but now the Ultrabook is getting this too. We seem to be heading into a world where swiping a card may soon be going the way of the modem. While Google is approaching it from the standpoint of using an Android phone to transmit credit card info to the credit card terminal, Intel is coming at it from a slightly different angle. It all started with the PayPass system a while back. That system utilized an RFID chip is a small dongle that was waved over a receiver. This transmitted the pertinent data to the terminal and allowed for the card info to be placed into the terminal and the purchase price was charged to the appropriate account. Now Intel has upped the ante a bit as they've added "another link in the security chain" and those of you who know me... know that I feel you can't have enough links in either your backup or security chains. The collaboration will combine MasterCard's expertise in payment processing and commerce with Intel's strengths in silicon innovation and chip-based security. It is designed to provide more options for a safer and simpler checkout process for online merchants and consumers using Ultrabook™ devices and future generations of Intel-based PCs. The two companies are working together to optimize a variety of emerging payments technologies, including MasterCard's PayPass® and Intel® Identity Protection Technology (IPT). Intel® Identity Protection Technology can enable consumers to use strong two-factor authentication and hardware-based display protection. This provides increased online security against malware. Additionally, when used with an Intel® Identity Protection Technology-enabled reader, consumers will be able to pay for online purchases with a simple tap of their PayPass-enabled card, tag, or smart phone on an Ultrabook device. "MasterCard is constantly working to improve the shopping experience for consumers and merchants," said Ed McLaughlin, chief emerging payments officer, MasterCard. "The collaboration with Intel will deliver enhanced security and faster checkout – with the convenience of a simple click or tap." "Our goal is to enable users of Ultrabook devices and future generations of Intel-based PCs to enjoy the convenience of e-commerce while making online payments safer from malware and hackers with the advanced security capabilities of Intel Identity Protection Technology," said George Thangadurai, general manager of PC Client Services Division, Intel Corporation. "Online commerce is a key focus area for Intel, and through this partnership with MasterCard, we intend to deliver an innovative, personalized and safer e-commerce experience to consumers." This is a curious "chicken & egg" story. When the original iPad came out, many tech lovers couldn't believe that Apple was't supporting mobile Flash on the device. There was a fairly big "brouhaha" about the whole deal and Steve Jobs was alternately praised & pilloried over the decision. However, Steve being Steve, he stuck to his guns, refusing to cave to pressure and the next generation of iPod was released still not supporting mobile Flash. It strange, but I really don't feel like I miss it all that much on the iPad I own. I also have a Motorola Xoom which does support Flash, and I don't find myself reaching for one device or the other based on what I need to view. I began thinking that maybe Steve was right, although I never fully drank the Apple Kool-Aid. Now, however, it's more chicken & egg than ever before. You see, on November 9th, 2011 at 5:59 a.m. Danny Winokur, Vice President & General Manager, Interactive Development at Adobe announced on the Adobe Blog, that Adobe would no longer continue to develop Flash Player in the browser to work with new mobile device configurations (chipset, browser, OS version, etc.) following the upcoming release of Flash Player 11.1 for Android and BlackBerry PlayBook. I'm not sure whether Jobs & Apple's failure to support Flash did t his or whetehr the writing was on the wall. Either way, Flash on mobile is now dead. For the full post & information, click on the link above. Although it doesn't happen frequently, it does happen. The law of averages states that if you do enough of a certain activity or manufacture enough of a product, you're bound to have a SNAFU eventually. So those of you who are fighting through something like this in your life... whether it be in your personal, professional, or even in health care... remember it happens to everyone every once in a while... even the mighty Apple. While I think we could all agree that Apple's quality control is pretty doggone good, the law of averages catches up to them on occasion. The latest problem has affected the first generation iPod Nano. I did a little research and this is what I found, directly from the Apple website. If you have a defective device, this should pretty much be all you need to know. However, even though the info below is a direct copy & paste of the page from the Apple.com website, it never hurt to check with the source in case things have changed. It has a black or white plastic front and a silver metal back - later iPod nano models have a metal front and back. See images on this web page. A few years ago I made the jump to 4.8x and I can't even begin to imagine what my treatment would be without it. My Orascoptic 4.8x telescopes go around my neck the moment I start my clinical day and they dont' come off until the last patient has left the office. They are as important to my treatment as my brain... since they provide a staggering amount of visual data that flat out helps me be a better doctor. However, just as important as the telescopes is the use of auxiliary lighting. I have amazingly light and powerful lights that attach to the telescopes and provide illumination to the field that one can't begin to envision using only a standard track-light. Bright, compact, and following my every movement... an LED on the end of your nose will change your posture and what you can see. Today is a prime example of this. I do all of my own endo, and today we were treating a case on tooth #19 (FDI 36) and it was through a porcelain fused to metal crown. Illumination was at a premium due to the metal sub-structure and the fact that the canals were severely sclerotic added to the difficulty. The pulp chamber had been obliterated by sclerotic dentin and the canals had receded into the roots making the location part of the access much more challenging. However, in these types of cases, good optics can greatly decrease the stress level and greatly increase the quality of care as well as the outcome. I normally wear my 4.8x with the Orascoptic Freedom LED system that has an output of 4000 foot candles. However, today as I began to look for canal orifices deeper than I was initially anticipating, I switched to my 4.8x with the Orascoptic Zeon Discovery. This LED has over 7000 foot candles of brightness and made a significant improvement in lighting deep into the access. We combined this with the LaboMed surgical microscope with an amazing Zeon light source. The LaboMed microscope performs well, but is designed for a general practice and comes with a significantly lower price tag than models designed exclusively for use in a specialist's office. When pairing these 2 technologies in the same appointment and procedure allowed me to locate the canals which might very well have gone undetected using conventional techniques. If you are not currently using magnification & auxiliary lighting, you owe it to yourself and to your patients to explore this amazing realm. I'm confident that you'll be glad you did. In 2006, while wandering the exhibits at the ADA meeting, I came across the Dental R.A.T. This is a device that was invented by a hygienist who was looking for a better way to do perio charting on a computer. She had found the keyboard to be frustrating and slow so she began to try and think of an alternative input system. What she devised was a computer mouse that is controlled by your foot. Hence the large mouse (or a Rat) was born. The R.A.T. ( for Remote Access Terminal) is a cordless and battery operated mouse that is placed on the floor of the operatory. From there, the user can put their foot on teh device and fully control the computer in a manner that is completely hands-free. It is set up to allow for complete computer control as well as perio charting. This is accomplished by having buttons on the device that correspond to the numbers recorded during perio probing. This year, my colleagues and I on the Pride Technology Panel awarded the Dental R.A.T. a Pride Institute Best of Class Award. If you are looking for an easy way for our hygiene department to accomplish their tasks, give this product a look. As a deal to you loyal readers, the company is offering their "show special" from the AAP to you. Just order and tell them you heard about the deal here on the blog. Hey, there ought to be some perks for reading!!! For an idea of what a "state of the art" digital pan has for resolution and detail, click the image above to see it full size. As most of you will remember, we recently installed the new Gendex GX DP-700 digital pan machine in my office. The "700", as we have taken to calling it, is a pretty amazing piece of technology. 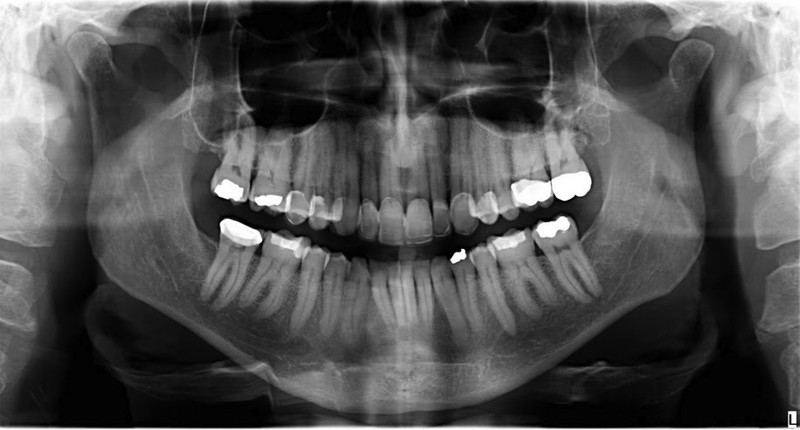 Also, as you can see above, it produces some stunningly beautiful radiographs. We've had the device in service now since October 28th and it has impressed us from day one. The DP-700 is the newest device in the Gendex pano line and is upgradeable with features such as a ceph arm and 3D cone beam capabilities. It even has the really cool feature of being able to take bitewing radiographs should the need arise. We decided to upgrade our pan capabilities for a couple of reasons. The first was that our previous machine, the Gendex 9200, was starting to get a "bit" long in the tooth and the second is that the DP-700 allows us to take "half mouth" 3D cone beam scans. The half mouth scans are important to us since I do a fair number of endodontic retreat cases which are always easier when you first have a 3D scan to work with. My philosophy of retreatment is that there is a reason why the retreat is needed and it makes the treatment more predictable by having as much information preoperatively as possible. It's pretty amazing when you look at a case and find an untreated accessory canal or some type of bifurcation or other oddity that would be impossible to see without 3D. We're also placing more and more implants and having a smaller volume of scan means we get just as much information with less exposure, which is always a good thing. Add to that the fact that we're getting images like the one above on our panoramics and you can see why we're so excited about the DP-700. If you are looking for a pan that can provide every option right now... or in the future, give it thorough consideration. As regular readers know, I've been thinking about whether you really need a slideout keyboard any more. Then along comes this nifty little gadget that gives all kinds of gaming controls for any smart phone that has a BlueTooth connection. It's a pretty good idea. Supposedly the device was originally going to be iPhone only and would connect via the patented Apple connector, but the company decided it was just easier to bypass that idea and go with BlueTooth. It's currently being sold through ThinkGeek and is compatible with that website's games in the iCade iPad arcade cabinet. However, it will also work with Android as well. It uses its own power source so the only thing that will drain your phone is the actual game you are playing. The price is $75, which doesn't seem outrageous, and can be ordered by clicking on the link above. Thanks to everyone who attended any or all of the course that Marty, Paul, and I participate in during the Holiday Dental Conference. I had really great time and I can't believe how much I enjoyed hanging out in Charlotte for those 2 days. It was especially great getting to see my pal Bob Lowe on Saturday. Bob had been in Buffalo on Friday, but made a point to come down to the meeting just to hang out for a while on Saturday. I especially appreciate all of you who spent the morning with me on Saturday doing the 2 laser courses. You were a great couple of groups and had really great questions and feedback. You just don't know how much I appreciate that! Good morning from beautiful Charlotte, North Carolina... home of the Holiday Dental Conference. For the next 2 days my buddies Paul Feuerstein, Marty Jablow, and I will be doing the "Flying Circus of Dental Technology" know as Dental Technology Solutions. We'll be spending time going over subjects like: digital operatories, digital impressions, Internet for dentistry with social media, digital radiography & cone beam, computer backups, and lasers. So, there will be a minimum of Tweeting for the next 2 days, but we're going to have some fun! Jawbone is known for wireless devices, but those are Bluetooth headsets. Now they've come up with a really cool device to help you track your health. Called "Up" the device is a bracelet that, when worn, tracks things like, activity, sleep, etc. It then plugs into your iPhone, iPad, or 4th generation iPod to upload the data. What does the UP band track? The UP band has a built-in precision motion sensor that automatically tracks your movement (steps, distance, calories burned, pace, intensity level and active vs inactive time ) and sleep (hours slept, time to fall asleep, light vs. deep sleep and sleep quality). The device will be available soon for 99.99 which doesn't really seem outrageous for what it does. This definitely looks like something I'm going to be putting on the wish list. Here's a cool idea that is for Mac lovers/users only, but I know many of you who read the blog fit that category. This is a nifty gadget that attaches to your Mac power adapter and allows you to charge another device along with your notebook. That means you can leave a power adapter at home and lighten your load on the next trip! The PlugBug features a 10W power adapter to charge iPads, iPhones, iPods, you name it. One accessory lets you charge two devices at once. PlugBug is made exclusively for all MacBook Power Adapters, including current and previous models. Snap PlugBug onto your MacBook Power Adapter and you now have the first ever device that lets you charge your MacBook + iPad or iPhone simultaneously, from one wall outlet. Watch this video to see how easy it is to use PlugBug. The beautifully designed, bright red PlugBug packs a powerful 10 watts, providing the fastest charge possible to iPad and iPhone. Knowing iPad requires twice the power of a typical USB charger, the 10 watt PlugBug becomes a must-have Mac accessory. Between flights or before work, you can charge your MacBook + iPad or iPhone with PlugBug and one wall outlet. When you connect PlugBug to your MacBook Power Adapter you instantly have an all-in-one MacBook + iPad and iPhone charger. You can finally purge that tangled mess of chargers in your computer bag. Even better, as long as you have PlugBug in your bag, you never have to worry about forgetting a charger again. And, powering up with PlugBug beats using a $2,500 MacBook Pro as an iPhone charger. Stand out, stand alone charger. Only need to charge your iPad or iPhone? No worries. PlugBug works as a stand-alone wall charger too. Slide PlugBug off your MacBook power supply and slip on the included cap to use PlugBug as an extra iPad charger. A solid 10 watts of power ensures your iPad gets the quickest charge possible. The bright red finish makes it easy to spot PlugBug inside your backpack, computer bag or purse. Travelers visiting the US or Canada from faraway places can use PlugBug to convert an international MacBook Power Adapter into a North American compatible adapter. PlugBug in your bag means you’ll have a bonus USB charger too.